This is the perfect picture, right? 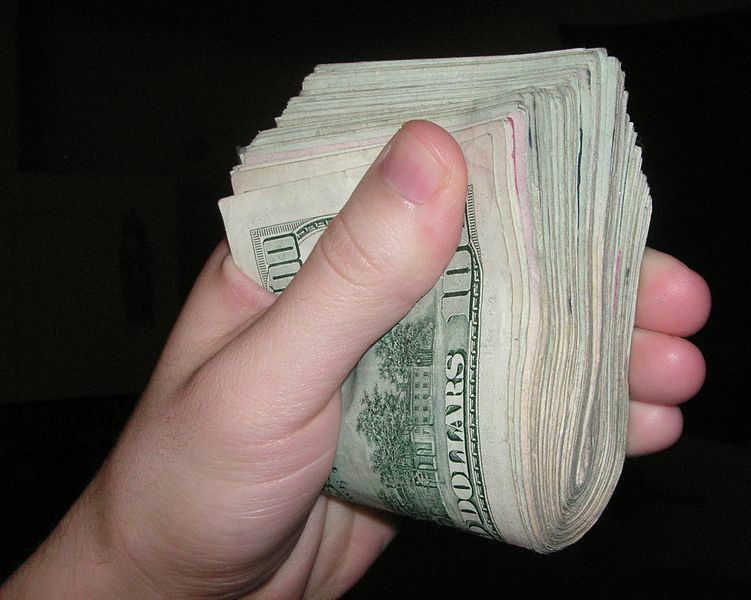 Because everyone knows freelance writers get paid with great wads of cash. When we start out working as writers, most of us think that means we’re going to spend our time writing. It can come as a shock when we find ourselves spending so much time marketing ourselves and our work, sending in proposals, queries & outlines, researching editors & agents, rewriting, and doing accounting. The real shock, however, comes when you have to become a collection agent. For the most part, I’ve been lucky. The magazines I’ve dealt with have been great to deal with. But there have been a few exceptions, two of which I’ve mentioned briefly on this blog before. The first step in collecting money is setting expectations. Make sure that you have negotiated payment terms in advance and that you have them in writing. Some small publications may not have contracts, but you can discuss the terms in email so you have a written record. Know whether you’re being paid on acceptance or on publication. This makes a big difference. “On acceptance” means that you will be paid when the editor agrees that your article is done and meets the magazine’s expectations. Actually, it’s no guarantee that your check will be cut that very day — only that acceptance is the trigger for generating your payment. You may get it in a week or in a month. “On publication” means that you’ll be paid when the issue of the magazine or newspaper containing your article hits the newsstands. Given typical lead times, you may well be turning in an article in July that’s intended for publication in December. Being paid on acceptance means probably receiving your money in August. Being paid on publication means more like January. Or possibly never. This brings up another contract issue: the kill fee. For a writer being paid on publication, a kill fee guarantees that you will still get paid something (usually a third to a half of the full fee) if the editor decides not to use the article after all. To me, it’s a danger flag if a magazine that pays on publication refuses to put a kill fee in the contract. In 2004, I was invited to write a guest column for a Canadian medical journal. As a freelancer, it’s always nice when someone approaches you instead of the other way around. I was excited about the opportunity to break into a new market and about the subject of the article, so I got sloppy on the contract and accepted a deal with no kill fee. I wrote about 700 words on the quality (or lack thereof) of medical information on the Internet from a patient’s point of view. Between the time I wrote the article and the time it was scheduled to print, the magazine was sold. The new owners didn’t want to use what I wrote. Even without a kill fee in the contract, it’s often possible to get something after the fact, but I was hampered by new owners who were disinclined to pay for work commissioned by someone else and by the fact that I was dealing with a magazine in a different country. A killed article can also be sold to another publication, but I had no contacts in the market so I pushed it onto a back shelf. Eventually, I just published it in this blog. The issue of Blacklisted! 411 that contained my Origins of Phreaking article. The editor, Zachary Blackstone, emailed me about an essay that I had on my website. We chatted back and forth and I told him about some content I had written for a book that wasn’t going to happen. 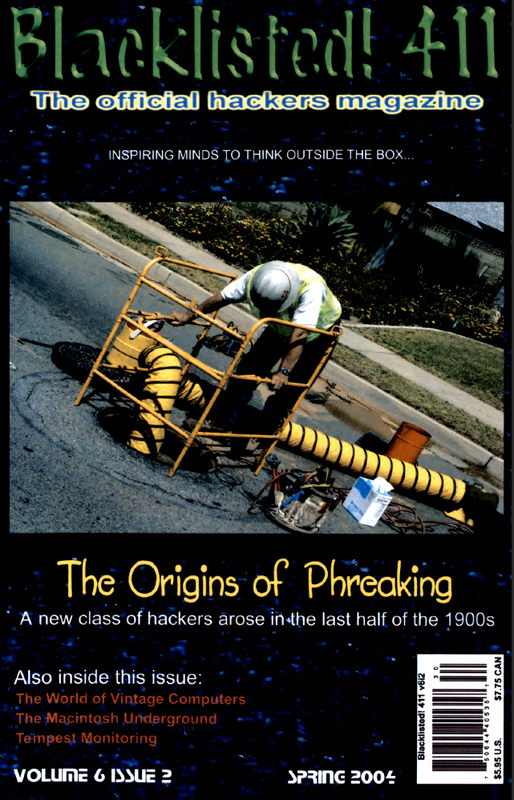 Two of the chapters from that book would make fine feature articles for his magazine: The Origins of Phreaking and Hacker-Phreaker BBS Stings. After a bit of negotiation, I told him he could run the essay free if he paid for the other two. All was well. I sent him the two articles, and after he checked the word count, he told me that he’d pay $1,125 for them. The essay ran first, then Origins of Phreaking. I expected a check within 30 days, but it didn’t come. A string of emails with Blackstone followed, during which payment was processed and didn’t happen. While this was going on, the next issue came out, with my BBS Stings article in it. Promises continued (I wrote a lengthy description of the dispute including email excerpts on Writer’s Weekly’s “Whispers & Warnings” if you’d like to read it) and I grew more and more concerned about getting paid. Blackstone stopped responding to me, and all of my research failed to come up with a physical address. Everything was PO Boxes. WRITERS BEWARE!!! Blacklisted! 411 claims to be a paying market, but they have not paid me for the articles I wrote for them. The editor-in-chief, Zachary Blackstone, told me on March 8, 2004 that payment of my $1,125 had been authorized and a check would be on its way shortly. All I have received from him since then is excuses. If you have a telephone number or physical address for Zach Blackstone or Blacklisted! 411 magazine, please email me as soon as possible! Thank you. I went through the magazine and collected contact information for all of the other authors and sent them emails asking if they had been paid for their work. Most didn’t respond. A few said that yes, they were having trouble getting paid. Several said they had donated their articles without expecting to be paid. Nobody said that they were paid promptly. Anyone going to DEFCON? I can’t make it this year, but I understand Blacklisted! 411 magazine is going to have a booth. I’m a professional writer who wrote some articles for them, and they owe me over $1,000. The editor-in-chief, Zachary Blackstone (***@comcast.net) promised payment on March 8, but has delivered nothing, despite using my articles as cover stories in the past two issues. If anyone has a physical address or telephone number for Blacklisted! 411 or Mr. Blackstone, I’d appreciate hearing from you. If you’re going to DEFCON, please stop by their booth and ask them why they don’t pay their writers. If you’re a writer, STAY AWAY from these folks. I had my money the next day. Postscript: A few years later, I happened to come across a website created by one of Blackstone’s former staff members, Israel Torres. He dedicated this entire website, http://www.blackballed411.org/, to describing the issues he had with Blackstone. Posted on 30 June 2013, in Blog and tagged articles, blackballed411, blackballed411.org, Blacklisted! 411, DEFCON, freelance writing, Hacker-Phreaker BBS Stings, Israel Torres, kill fees, magazines, newspapers, Origins of Phreaking, pay on acceptance, pay on publication, Whispers & Warnings, Writer's Weekly, Zachary Blackstone. Bookmark the permalink. Leave a comment.